Cyclessa (Desogestrel/Ethinyl Estradiol) is a medication to prevent pregnancy in women. This is for those who elect to use this product as a method of contraception. Besides preventing pregnancy, birth control pills may also make your periods more regular. It will lessen blood loss and painful periods. It will also decrease your risk of ovarian cysts and treats acne. How does Cyclessa (Desogestrel/Ethinyl Estradiol) work? 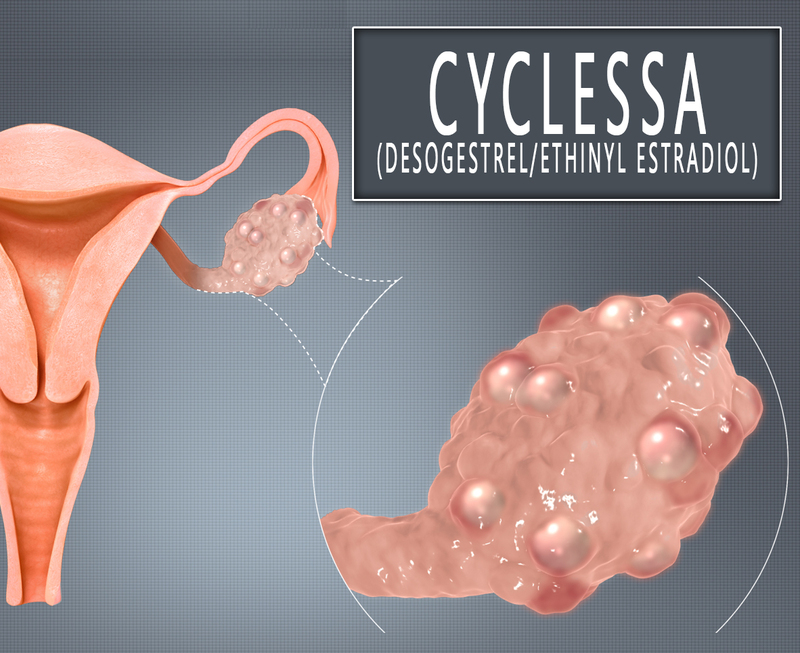 Cyclessa (Desogestrel/Ethinyl Estradiol) works mainly by preventing the release of an egg or ovulation during the menstrual cycle. It also makes vaginal fluid thicker to help prevent sperm from reach an egg or so-called fertilization. It also changes the lining of the uterus (womb) to prevent attachment of a fertilized egg. If a fertilized egg does not attach to the uterus, it passes out of the body. Why use Cyclessa (Desogestrel/Ethinyl Estradiol)? Cyclessa (Desogestrel/Ethinyl Estradiol) is a combined female hormone. It is Desogestrel and Ethinyl estradiol or progestin and estrogen. This treatment is a 28-day regimen of tablets. Using this medication will not protect you or your partner against sexually transmitted diseases like gonorrhea, HIV, or chlamydia). The Food and Drug Administration (FDA) has approved this medication. How to use Cyclessa (Desogestrel/Ethinyl Estradiol)? Cyclessa (Desogestrel/Ethinyl Estradiol) first light yellow tablet is taken on the first day of menstrual bleeding. This is to be taken once a day, by mouth, and with a full glass of water. Pick a time of day that is easy for you to remember and take it at the same time each day. Taking this after your evening meal or at bedtime may help if you have an upset stomach or nausea with the medication. Follow the prescription of your doctor very carefully to avoid some complications. What are the side-effects of Cyclessa (Desogestrel/Ethinyl Estradiol)? This medication may raise your blood pressure. Check your blood pressure regularly and call your doctor if the results are high. Let your doctor know if you have any medical history or any allergies. This drug may reduce breast milk production. Consult your doctor before breastfeeding.